From luxurious fabrics to rich wood tones, Hemisphere by Salem is truly in a class of its own. 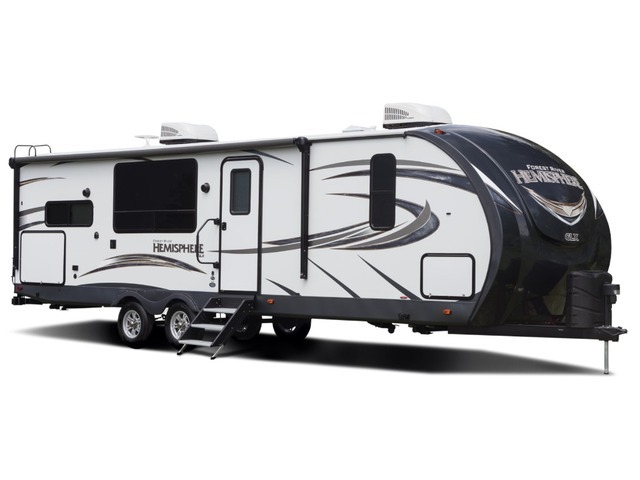 Plus, you’ll enjoy better gas mileage and a smoother ride with the wind resistant design of the Hemisphere. Dry Weight 6,179 lbs Hitch Weight 730 lbs Overall Length 33' 3"
Dry Weight 7,294 lbs Pin Weight 845 lbs Overall Length 34' 4"
Dry Weight 6,799 lbs Pin Weight 700 lbs Overall Length 35' 0"
Dry Weight 8,439 lbs Hitch Weight 880 lbs Overall Length 37' 5"
Dry Weight 8,354 lbs Pin Weight 960 lbs Overall Length 39' 0"
Dry Weight 7,986 lbs Pin Weight 990 lbs Overall Length 37' 4"
Dry Weight 8,204 lbs Hitch Weight 977 lbs Overall Length 37' 10"